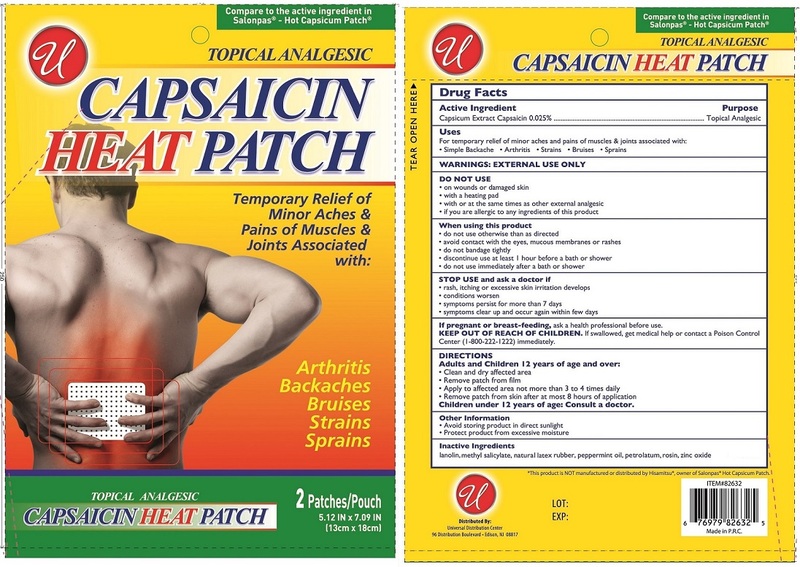 Proprietary Name: Capsaicin Heat What is the Proprietary Name? Non-Proprietary Name: Capsaicin What is the Non-Proprietary Name? Capsaicin Heat with NDC 52000-040 is a a human over the counter drug product labeled by Universal Distribution Center Llc. The generic name of Capsaicin Heat is capsaicin. The product's dosage form is patch and is administered via topical form. Dosage Form: Patch - A drug delivery system that often contains an adhesive backing that is usually applied to an external site on the body. Its ingredients either passively diffuse from, or are actively transported from, some portion of the patch. Depending upon the patch, the ingredients are either delivered to the outer surface of the body or into the body. A patch is sometimes synonymous with the terms ‘extended release film’ and ‘system’. Keep out of reach of childrenIf swallowed, get medical help or contact a Poison Control Center (1-800-222-1222) immediately. DirectionsAdults and Children 12 years of age and over:Clean and dry affected areaRemove patch from filmApply to affected area not more than 3 to 4 times dailyRemove patch from skin after at most 8 hours of applicationChildren under 12 years of age: Consult a doctor.